Lack of economic opportunity is one of the issues that scores highly when it comes to global concerns amongst 18-35 year olds. Global warming, income inequality and government corruption are among the issues most likely to keep young people awake at night. For 18-35 year olds across the planet, the biggest global concern is climate change. 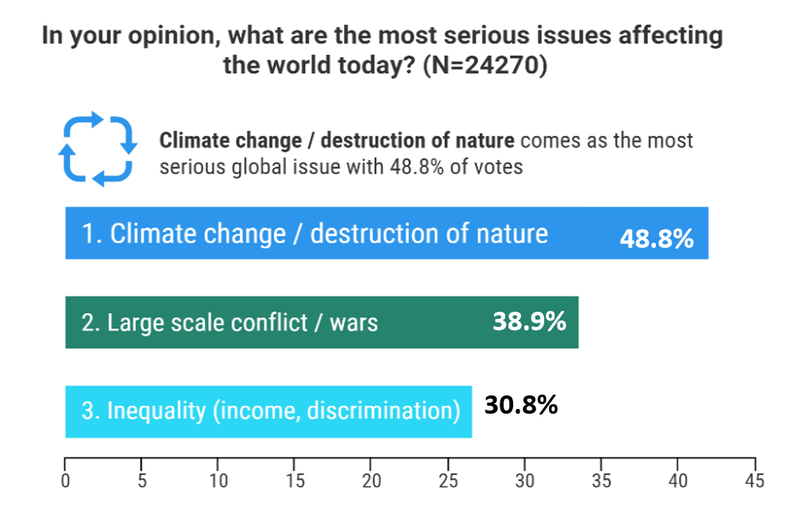 The World Economic Forum’s latest Global Shapers Annual Survey 2017 of 25,000 young people from 186 countries found that nearly half of all young people rank climate change and the destruction of nature as the most serious issue affecting the world today. Wars and inequality also score highly when it comes to global concerns. However, there is a marked shift in attitude when young people are asked to name the three most pressing issues of concern in their own countries. Here “Government accountability and transparency/corruption” comes out on top with 46.9%, followed by “Inequality” (38.1%) and “Lack of economic opportunity/employment” (30.5%). There are several regions that go against this overall trend: in Oceania, including countries such as Australia and New Zealand, climate change is the number one concern both nationally and globally; in Europe and North America it is inequality that worries young people the most; and in the Middle East and North Africa it is a lack of economic opportunity and employment that dominates; more than half of all respondents from the region say this is their chief concern. While large scale conflicts and wars concern young people at a global level, far fewer are concerned about them at a local level. Only in Eurasia – where nearly three quarters of respondents came from Ukraine – did fears about conflict figure highly, coming second after concerns about government transparency and corruption. Other local variations in concerns are revealed when votes in the survey are analysed on a country-by-country basis. Europe’s demographic timebomb is a particular worry in Switzerland and Germany, with an ageing population being first and second respectively among the concerns of young people in those countries. And young people in the West African country of Benin are most concerned by the poverty in their country. Both globally and at a regional level, equal access to opportunities is considered the most important thing to make young people feel more free. There are only two countries where this ideal fails to come top: Benin, where job security is most desired; and Switzerland, where respondents said there was nothing at all that could make them feel more free. The good news is that while income inequality and equal access to opportunities clearly weigh heavily on young people’s minds, many also feel that the world is moving in the right direction – at least as far as the gender gap is concerned. Millennials are confident overall that the gender gap will be reduced during their professional lifetime, with 64% saying that they “somewhat agree” (38.9%) or “strongly agree” (15.1%) with that statement. Such optimism seems to be grounded in a belief that individuals can make a meaningful difference in the world. When asked who has the greatest responsibility for making the world a better place, the number one answer (34.2%) was “Individuals”. If these individuals who can change the world are to come from the current generation of young people, then there are three things that they say they need above all else to thrive. 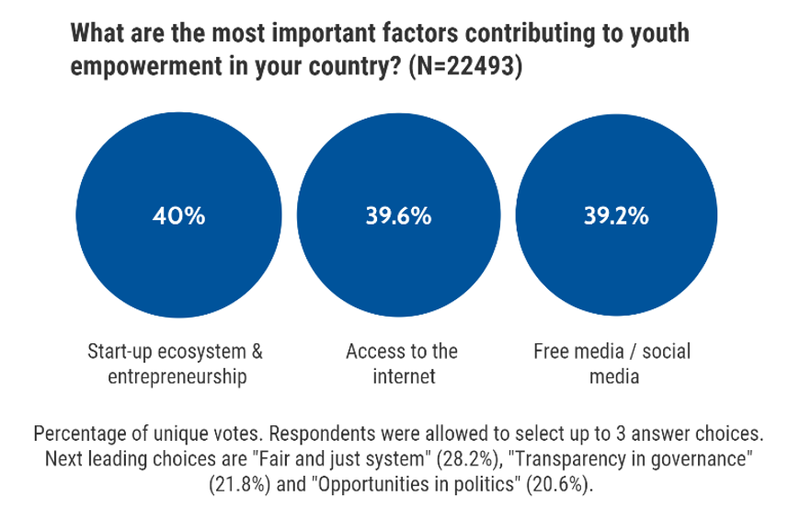 Globally, participants in Global Shapers Annual Survey 2017 say the three most important factors for youth empowerment are: a “start-up ecosystem and entrepreneurship”; “access to the internet” and a “free media/social media”. While regionally there was one deviation from this trend (in Europe a “fair and just system” is ranked first), overall young people seem to favour the free market and technology as the best means of meeting the world’s challenges. What do young people value?